Though Weather Radio is a great way to know exactly what is going on, and NOAA and the NWS have worked hard to provide accurate information, predictions are not always correct, and reliance on electronics as your only source of understanding the weather can be dangerous. As you become an experienced boater, you learn that there are many signs that will help you get an idea of what kind of weather is approaching. Some are based on folklore, but many have proven to have some truth to them. Here are some of the different things to watch for, and what they may mean. Cirrus Clouds: These high, wispy clouds are an indicator of several things. They are ice clouds positioned high in the atmosphere, and are a sign of fair weather in the near future. Because these clouds are so high, their shape can also let you know about weather over the coming hours and/or days. If the clouds appear to be long and wispy, like they are blowing in the wind, or if you actually see them moving, then a change in weather is imminent. If they are stationary and small, without a windblown appearance, your nice weather will stay for a while. Winds: Keep an eye on the wind direction. A shift in direction means a change in weather. Most prevailing winds in the Northern Hemisphere go from west to east. A persistent wind blowing due north or south may have a strong system connected to it, and it may be worth listening on the VHF for a forecast if you spot this and are in range of the land-based transmitters. Remember that winds can mean either an approach of good or bad weather, so watch for other signs to determine the direction that it is likely headed. This includes the changes in cloud types, the changes in pressure, and the changes in the behavior of your local animals. Distant Storms: When you are at sea, you can often see the edges of storms and cloudbanks. These may head toward you, or they may pass you without disturbing your location. Before you panic, keep an eye on the apparent direction of travel, watch for other impending storm signs, check your barometer frequently, and remember that storms often can change direction, and larger storms tend to travel in a circular pattern. Scent: As humidity increases, so does your sense of smell. 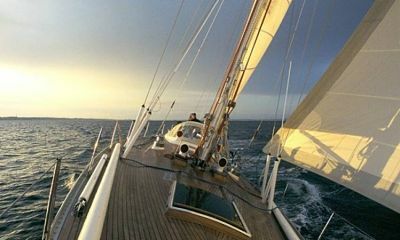 A day at sea where everything smells much stronger than usual can mean an impending rain. Be careful that it is accompanied with other signs of changing weather, however. It can also mean other less weather-related things, like pregnancy, seasickness, or that it is time to wash the boat. Celestial objects like the sun, moon, and stars are beautiful to look at. They also have a great ability to highlight moisture in the air that cannot be seen by the naked eye. This feature makes them excellent weather predictors. There is an old rhyme that says: “Ring around the moon, rain before noon. Ring around the sun, rain before the day is done.” Whether the air is cloudy, hazy, or clear, these rings are a reflection on moisture-laden ice crystals in the atmosphere. Large rings are called haloes, and small rings are called either lunar or solar coronas. The tighter the ring is to the edge of the celestial body, the more time you have before a rain. Large, loose rings are more predictive of rain within a few hours or less. The strength of the ring is often correlated to the strength of the coming rain. If you can count a number of stars between the edge of the halo and the moon, then there is not enough humidity for a large rain event, and will likely mist or sprinkle instead. Wind events can also be seen in a halo — twinkling stars suggest quick moving crystals. Approaching winds and double haloes are often heralds of stormy weather as well. It is important not to confuse a halo with something termed a “fire bow.” This is a section of cirrus clouds that is lit up like a rainbow near or because of the light from the sun. These most often occur when the sun is low on the horizon. The clouds that are reflecting like a rainbow are not precipitating, but are ice crystals acting as a prism. Pressure is a huge predictor in upcoming weather. As a general rule, nice weather is in an area with high pressure, and stormy weather is in an area with low pressure. Air always wants to go from a high-pressure area to a low-pressure area, and because of this, regions that sit between high and low pressure regions are often very windy. The tool that boaters and other weather predictors use to monitor this pressure change is called a barometer. This handy tool can tell you several things. As pressure increases, the weather will become nicer. As pressure decreases, weather will often become rainier. The faster that this change happens, the more winds will likely accompany the change. Pressure changes can also be felt, to some extent. Anyone who has had a broken bone or arthritis knows the feeling of aching bones before a change in the weather. This is due to the fact that the drop/gain in pressure outside the bone is different than what is inside the bone. This creates pain, which, though annoying, is a wonderful weather gauge. Sea Bird Feeding Behavior: Birds that nest inland and hunt at sea are great to watch. If you are out boating and see a high number of sea birds like gulls, sea ducks, frigate birds, cormorants, tropic birds, and puffins, this is a sign that the water will be calm, as all of these birds know to seek shelter during foul weather. Be certain you know your birds if you want to use this trick. Other sea birds like albatross and shearwaters can stay at sea for months at a time without needing time on land, and these birds are often found during a storm. Shearwaters may even seek solace on your boat during a large tempest in high numbers. Porpoise Direction of Travel: Though dolphins can travel in stormy weather over long distances, their cousins prefer to stay closer to shore, and can provide hints at coming bad weather. If you see a porpoise, or school of porpoise who are headed very deliberately in one direction or another, take note of what lies in that direction. If they are headed toward sheltered bays, there may be a storm coming. If they are moving toward more open waters, the weather will likely be nice. Be certain to watch that they are traveling in one direction, quickly, rather than milling about in the same area, going different directions. This constitutes feeding behavior, and will not tell you where they are headed. You can take note of the openness of the area around you where they are feeding, however, and decide if they have sheltered themselves for a weather change or if they are happy even though you are exposed. Spider Webs: Though maybe not something everyone wants to find on their boat, a spider web can be a useful weather tool as well. Spiders are very susceptible to being blown by winds, and take precautions as a result. If a spider is hiding on a protected edge of its web, instead of hanging in the center, winds may be coming. But if it is in the web’s center, it could indicate that fair weather will be around for a while. Snails: If you are in a rocky area with a lot of sea snails that hang out on rocks, watch where they prefer to sit. If they are on the top of the rocks, they have no concern about stormy waves knocking them off. If the rocks are bare, and they have taken shelter underneath, beware of upcoming winds or swells. The key to any good boating experience is to stay observant of the world around you. As you make sense of your environment, you will likely be able to develop your own sense of what weather predictors work best for you in your specific area. Keep a journal of observations and resulting weather to test your ideas. It is also important to remember to stay safe during any bad weather by simply avoiding it, seeking shelter, or preparing your boat for safe passage.